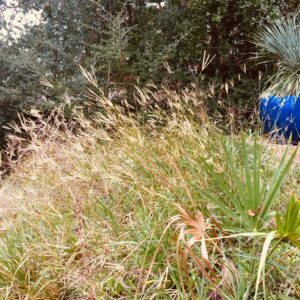 This is the real sweetgrass which the Gullah use for basket weaving. Its blooms and side cast a pink haze along salt marshes and sand dunes. We propagated our plants from native populations that had been repeatedly butchered by Beaufort Co, SC road maintenance crews. Plant them in a well drained sunny place. They tolerate periodic salt flooding and salt spray and help stabilize sand dunes and salt marshes. They are highly deer-resistant. Interplant them with tastier plants to protect them from browsing. We started our current batch in the fall of 2017. They are the perfect size for planting now. That coarse stuff you see offered at “fake native plant sales” is not our native Sweetgrass . It is Gulf Muhly, a poor substitute from Florida. Gulf Muhly is now planted in highway medians, causeways and Lowe’s parking lots all over coastal SC and GA. Gulf Muhly is not suitable for basket weaving. It is threatening the continued survival of our rare Sweetgrass (Muhlenbergia sericea) with genetic swamping . Besides why would you want your garden to look like the Lowe’s parking lot.